Speciality: Serving large portions – come hungry or, share! Having driven by this place for years, thinking it was just another diner along the side of Hwy. #121 and probably fine for a burger with fries and a milkshake, I never gave it much of a thought or considered stopping in to check it out. Big mistake. Huge! My dear friend Chef Mary Bergin came for lunch on a Sunday afternoon that turned into a dinner that turned into a sleep-over and before retiring she asked if we should go out for breakfast the next morning. Hubby declined (business meetings pending) but I said, “Sure, where do you want to go?” Having never been to Boon Fly Cafe, that was her pick. The next morning, at the crack of 9:30 am we hit the open road. 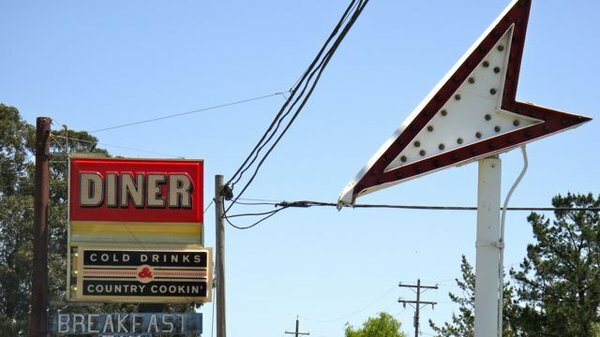 Upon passing The Fremont Diner en route to Boon Fly Cafe, I mentioned to Mary that I intended to do a review of the little restaurant sometime in the near future. She responded with, “Why not today?” Indeed. Why not? A quick U-turn later, we were parking in the Fremont Diner lot. 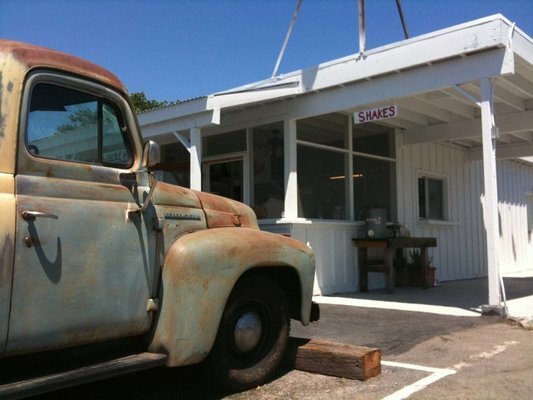 The visual of this place screams nostalgia; complete with a rusty circa 1950’s pickup truck parked directly in front of the entrance. Against the wall, a vintage Coca-Cola ice chest. Through the door and into the restaurant, a homey atmosphere with replica signs from the 50’s, wooden tables, metal chairs, and a small counter directly in front of the open kitchen. Cool. On a Monday, this place was full and Mary asked if this was unusual – “Not at all, we’re busy every day,” came the waitress’ reply. Nobody stays busy for long if the food isn’t good. So what’s on their menu? 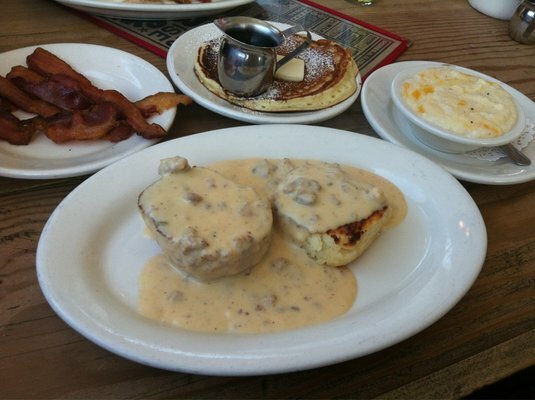 Well, “Almost Famous Biscuits & Gravy” ($8.99**** two buttermilk biscuits & house made gravy and house made sausage crumbles) – “Ricotta Pancakes” ($9.99**** made with Bellwether Jersey Ricotta) – “Egg Breakfast”($9.99*** with 2 eggs, toast, house made sausage or bacon and breakfast fries or cheesy grits) appealed to us. The Almost Famous Biscuits & Gravy is the bomb and I am not a fan of this dish but, with Chef Mary’s encouragement I decided to get my feet wet. OMG! This could become addictive! Ricotta Pancakes were as light and fluffy as they should be. Since I’m not a Cheesy Grit kinda girl, I depended on Chef Mary and she gave a definitive thumbs up good. "Almost Famous Biscuits & Gravy" - "Hickory Smoked Bacon" - "Cheesy Grits" - "Ricotta Pancakes"
Other items on the breakfast menu included: “Hangtown Fry” ($12.50 – Drakes Bay Oysters, remoulade, potatoes, bacon and scrambled eggs with baby mustard); “Huevos Rancheros” ($9.99 – Fried tortillas, refried pinuito beans, eggs poached in ranchero sauce, avocado, sour cream and cilantro); “Chicken & Waffle“ ($10.99 – Thin American style waffle, fried chicken your choice of light or dark meat, syrup & sweet butter); “Fremont Granola” ($4.50 – Sorghum & local honey granola with clover yogurt & quince jelly). I’ll just bet their hamburgers and fries for lunch time are killer! Another visit? You betcha and I’ll also wager hubby will make sure he’s available for that…..